I cannot imagine a single day without art. Art enriches our lives and feeds our innate quest for the beautiful and the imaginative. It evokes love, loss, anger, discomfort, emptiness, longing, and empathy. Art has the power to bring people together and drive them apart. Experiencing art can be an individual act or a communal one, each powerful in different ways. December 1 has come to be known among art and AIDS organizations as Day With(out) Art. Now in its 25th year, Day With(out) Art is a call to action against the AIDS pandemic and its devastating effect on art and culture. As a curator of manuscripts, this day prompts me to reflect on the enduring relevance of centuries-old images in our collection, ones that reveal and celebrate the vulnerability of the human condition. 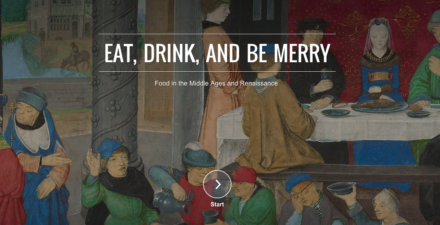 Though the collection is centered on Christian art of the Middle Ages and Renaissance, it contains themes that resonate far beyond belief, time, and place. Like people, artworks endure—and sometimes succumb to—pandemics, disasters, and wars. Museums preserve the survivors. 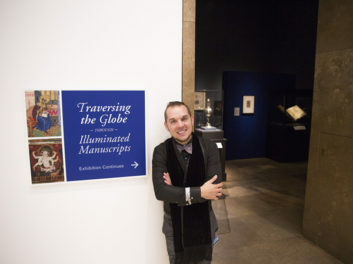 Archives and libraries (such as the Getty Research Institute) both deepen our appreciation of what remains and help us piece together the histories of what does not. 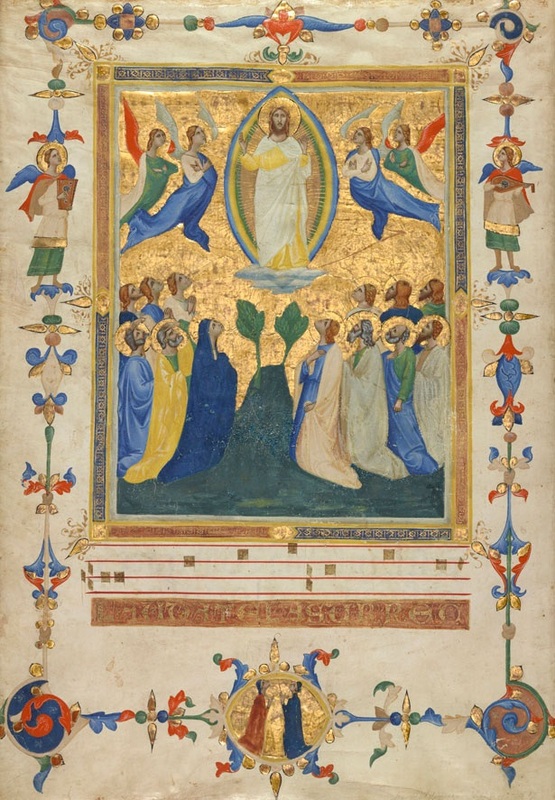 The story of this exquisite page depicting The Ascension of Christ is one of loss and survival. It was illuminated by an artist associated with the workshop of painter-illuminator Pacino di Bonaguida, one of many artists who appears to have died from the 14th-century outbreak of bubonic plague known as the Black Death. This epidemic’s indiscriminate toll on life across Europe is not unlike the sting of death inflicted by AIDS across the world today. In the miniature, the faithful gaze in wonder as the newly resurrected Christ ascends into heaven, an image that would have been particularly poignant in the wake of the human devastation caused by the plague. This single leaf is one of three in the Getty’s collection that once formed part of a book of songs of praise called the Laudario of Sant’Agnese. A group of wealthy laymen and women in Florence commissioned this luxurious manuscript in the years leading up to the Black Death of 1348. Later in history, as part of 19th-century collecting practices, the laudario was disbound and individual leaves sold to private collectors who prized such masterpieces in miniature. Despite the many twists and vicissitudes of history, we are fortunate to know the work of Pacino’s collaborators on the Laudario of Sant’Agnese through 31 leaves, cuttings, and fragments from the manuscript now housed in 19 collections across Europe and the United States. This single book, though damaged and dispersed, has endured across eight centuries. Loss of life was an ever-present reality in the long Middle Ages, and death was at the forefront of the medieval mind. The devout recited daily prayers to commemorate the souls of the deceased and to prepare their own minds, bodies, and spirits for the inevitable and impending death. Additional masses were often said in memory of the dead on Mondays. This illumination from a medieval prayer book employs a burial scene to remind us, the living, of our own fragility. Candles flank a casket draped in blue cloth woven with golden sunbursts and a cross pattern as the officiant (at top right) prepares to lead the Office of the Dead. Tonsured clerics sing from a choir book and hooded monks or friars gather in solemnity, one offering alms to a crippled man. Even as the dead are remembered, so too are the suffering who yet live. The pages that follow discuss the virtues of compassion and charity, which grow from our connection to the humanity of others and ourselves. The text for the Office of the Dead in this manuscript comes from Psalm 114 and includes beautiful sentiments about receiving aid from the divine, deliverance from the sorrows and tribulations of death, and eternal rest and perpetual light. 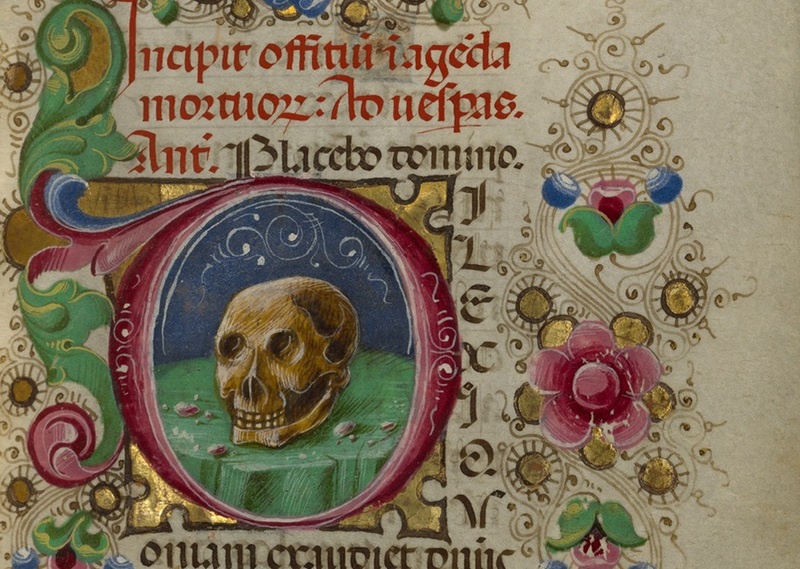 The initial D at the top of this post by artist Taddeo Crivelli begins the same passage, with the skull serving as a memento mori, a reminder of the fleeting nature of life. Death comes for us all. How generously do we choose to live with the time we are given? Charity is often synonymous with love, and Christ’s sacrifice on the cross was considered the ultimate act of love for humankind. 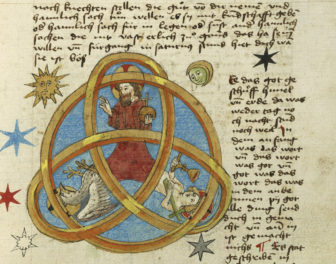 Thus it is appropriate that the illuminator drew lines physically linking the wound in Christ’s side with Caritas’s heart and the poor man’s staff. 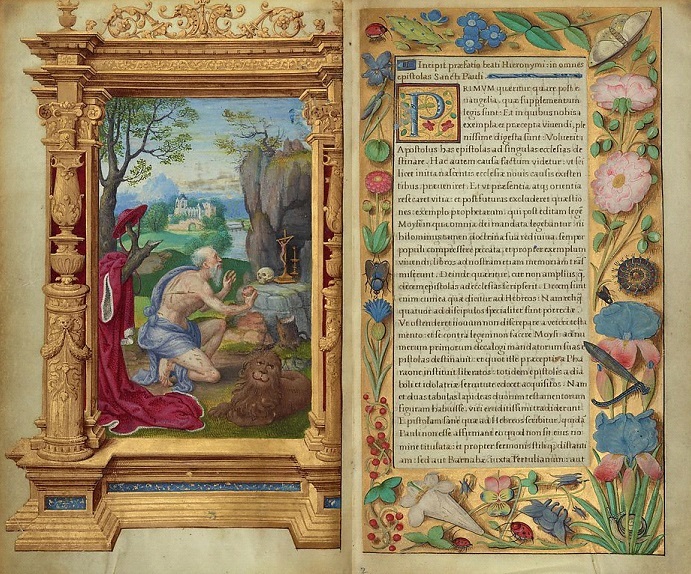 The author of I Corinthians 13:13 wrote that charity (or love) is the greatest virtue among faith, hope, and charity, a statement as relevant today as when this manuscript was illuminated over 500 years ago. Indeed, it is worth repeating and truly considering the implications of the phrase contained on this miniature: “Whoever has charity or love covers a multitude of sins.” Love is a universal virtue to be championed above all dogmas, stigmas, and other divisive beliefs. Medieval viewers were especially accustomed to meditating upon images of sorrow and suffering, subjects most of us seem anxious to avoid. One of the most startling and moving representations of individual agony in medieval art is the Seven Sorrows of the Virgin, which depicts moments of pain and loss from the Virgin’s life with Christ. 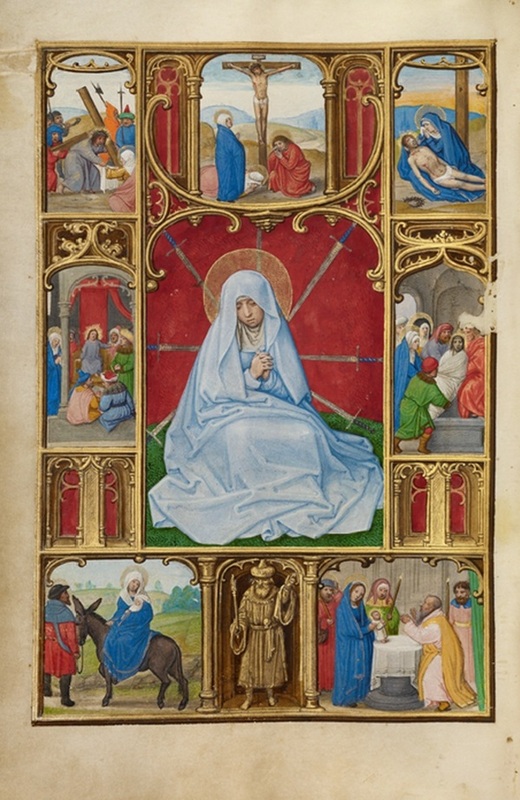 In the Seven Sorrows below, illuminator Simon Bening depicts the Virgin Mary in an act of quiet but longing meditation, surrounded by seven swords aimed at her heart. Each sword corresponds to a scene in the miniature’s frame: the moment when Jesus was circumcised, when the Holy Family fled to Egypt to protect the newborn infant, when Mary and Joseph lost the young Jesus in the temple, when Christ carried the cross to Calvary and his subsequent crucifixion, the time of mourning after his death, and his entombment. The texts accompanying the image in this book directed the thoughts and emotions of a medieval reader-viewer to the pain Mary felt at each stage in her son’s life. Part of the human condition is to empathize cognitively, emotionally, or compassionately with those around us during times of sorrow and joy. Here we see art as a powerful vehicle for fostering a sense of shared experience, engendering mutual respect, and inspiring a new perspective. Time’s power over art extends beyond physical destruction to the erasure of identity. 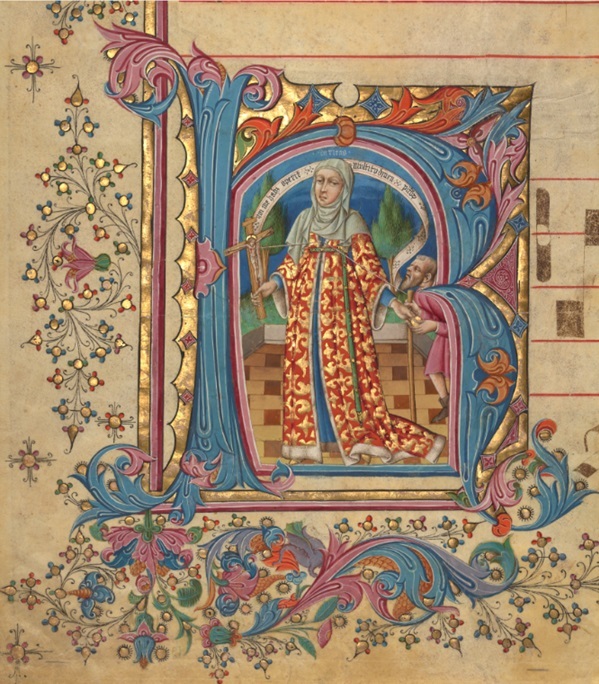 Within the pages of many manuscripts at the Getty are stunning miniatures by artists whose names have been lost. 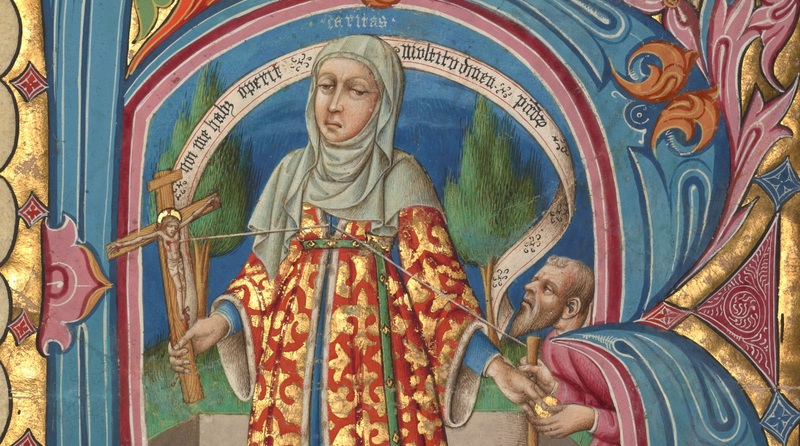 Attributing a work of art to a specific artist can be complicated—particularly in the case of manuscripts, which were often created through collaboration (This was the case for artists working in the orbit of Pacino di Bonaguida or Taddeo Crivelli, both of whom we encountered earlier). Far fewer works of art were signed in the Middle Ages than in the modern period, and archival sources are rarely complete or comprehensive. Art historians have sometimes assigned monikers to elusive artistic personalities whose hands can be recognized, even as their names remain unknown. The so-called “Master of the Dominican Effigies,” for example, takes his name from a panel painting in Florence of Dominican saints and blessed figures. A painter-illuminator, this artist appears to have collaborated frequently with others from the orbit of Pacino di Bonaguida. In fact, he contributed to the Laudario of Sant’Agnese, the disbound book described earlier. Other anonymous artists, like the Master of the Cypresses, are often associated with known and documented artists, Pedro de Toledo in this case. Still others, like the Master of the Getty Epistles, are named after the best representative work in their particular style. In the detail below, we can marvel at the precision of the artist’s rendering of landscape, perspective, and volume, and be moved by Saint Jerome’s act of piety, having flogged himself and beaten his chest with a stone in imitation of Christ’s suffering. The illuminator even rendered blood lines and bruises on Christ’s tiny body on the crucifix. 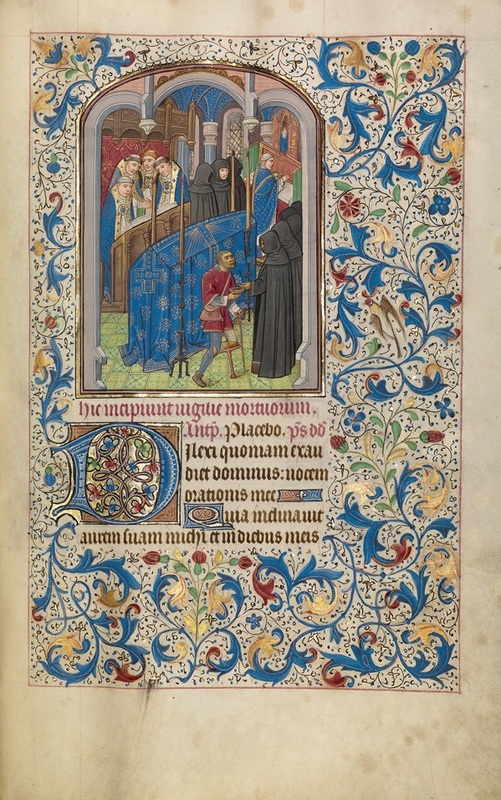 There are about sixty of these “masters” in the Getty collection, and as a group, they represent a history of manuscript illumination that could rival (or surpass) even the greatest masterpieces by named artists. The litany that follows enumerates each of these anonymous artists, whose lives have been lost to time and pieced together by generations of scholars. Although these artists lived long before the AIDS crisis, their work is an important part of our shared cultural heritage, despite the fact that their identities remain unknown. Day With(out) Art is a time of remembrance and celebration of the artistic and cultural contributions of all individuals, all communities. I think it is a fitting day to commemorate people whose lives make a difference, ensuring that no name is lost to history. 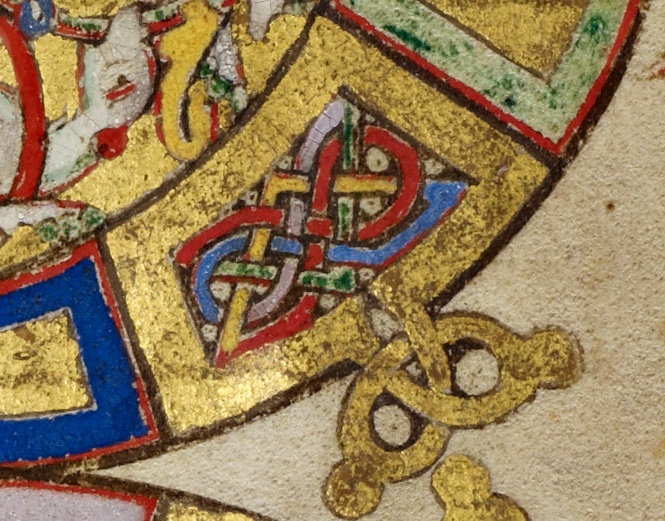 While preparing to write this post, I stumbled upon a poignant red ribbon—similar to the AIDS ribbon—as part of an interlace initial B in a manuscript illuminated by an unknown, and still-unnamed artist. Knotwork and interlace patterns in medieval art are at times interpreted as guides for meditation or as repellents of evil. Either association finds its parallel in the meaning of the AIDS ribbon. I thank Elizabeth Morrison, Annelisa Stephan, Rheagan Martin, Andrew Westover, and especially Mark Mark Botieff for sharing thoughts that helped shape this post.